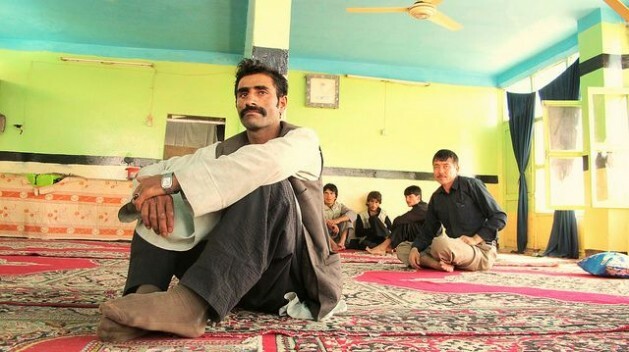 ZARANJ, Afghanistan, Sep 16 2014 (IPS) - “Of course I’m scared, but what else can I possibly do?” asks Ahmed, a middle-aged man seated on the carpeted floor of a hotel located on the southern edge of Afghanistan. He is bound for Iran, but he still has no idea when or how he’ll cross the border. In his early 40s, Ahmed looks 15 years older than his real age. He says he has no means of feeding his seven children back in his hometown of Bamiyan, 130 km northwest of Kabul. Being illiterate poses yet another major hurdle to earning money and supporting his family. “We’re all starving back home,” Ahmed tells IPS from his position on the floor where he will rest until the smugglers finally show up. It won’t be too long now, he says. “They never spend more than two days here,” notes Hassan, the innkeeper, who prefers not to disclose his full name. He is well versed in the details of Ahmed’s impending journey, since he is the one who mediates between his ‘guests’ and the smugglers who – for a sizeable fee – facilitate the trip across the border. “They’ll be taken in the back of a pickup all the way down to Pakistan. From there they have to walk through the desert for a full day until they reach the Iranian border. Many don’t even make it there,” Hasan tells IPS. Ahmed is just another customer at another one of many similar establishments scattered around Zaranj’s main square, 800 km southwest of Kabul. This is the capital of Afghanistan’s remote Nimruz province, the only one that shares borders with both Iran and Pakistan. Also called ‘Map Square’, due to a giant map of Afghanistan hanging atop a huge pedestal, Zaranj is the last stop before a journey, which, in the best-case scenario, will be remembered as a nightmare. Every day, thousands of Afghans put their lives in the hands of mafias that offer them an escape route from a country still in turmoil 13 years after the U.S. invasion in 2001. In 2011, some 35 percent of Afghanistan’s population of 30.55 million people lived below the poverty line, a situation that has barely improved today. The official unemployment rate stood at seven percent that same year, but the International Labour Organisation (ILO) estimates that this number could be much higher. Thus it comes as no surprise that Afghanistan is, after Syria and Russia, the source country for the largest number of asylum seekers worldwide. A recent report by the United Nations Refugee Agency (UNHCR) found that in 2013 alone, some 38,700 Afghans requested refugee status, accounting for 6.5 percent of the global total of asylum seekers. Of the many destinations, Turkey remains by far the most popular, with 8,700 Afghan refugees requesting asylum last year. Other industrialised countries like Sweden, Austria and Germany also attract a good share of Afghans in search of a better life, but the proximity of Iran, coupled with a shared language, makes it a far more sensible choice. What many migrants find across the border, however, is a far cry from the warm embrace of a kindly neighbour. There are less than two kilometres between Map Square and the official border crossing with Iran. It’s obviously not the way out for Ahmed, but it might well be his route back. Right next to the bridge over the Helmand River, the “no man’s land” between the two countries, lies “zero” point. It’s the place where all Afghans coming from the other side, either deported or on a voluntary basis, are told to register in. At five in the evening, their number almost reaches 500. “Only today we have registered 259 deportees and 211 who came voluntarily,” Mirwais Arab, team leader of the Directorate for Refugees and Returnees at the “zero” point, explains to IPS. “Among all these we can only address the most immediate needs of 65; we give them food and shelter for the first night and a small amount of money so that they can go back home,” adds the government official. Given the number restrictions, and the limited assistance available, the majority of migrants keep walking once they have registered in. This is not an occasional drip but a steady stream of exhausted men. The sense of defeat is overwhelming. Many of them, like the Khalil brothers, aged 21 and 22, are very young. They tell IPS that they reached Iran six days ago, via Pakistan, after a long journey across the desert. “We were going to Tehran but were caught in Iranshahr – 1,500 km southeast of the Persian capital. The police beat us with batons and cables, all over our bodies, before taking us back to the border by bus,” recalls Abdul, the elder of the two, speaking to IPS on the hard shoulder of the road at Zaranj’s southern entrance. The Arifis’ story is even more dramatic. 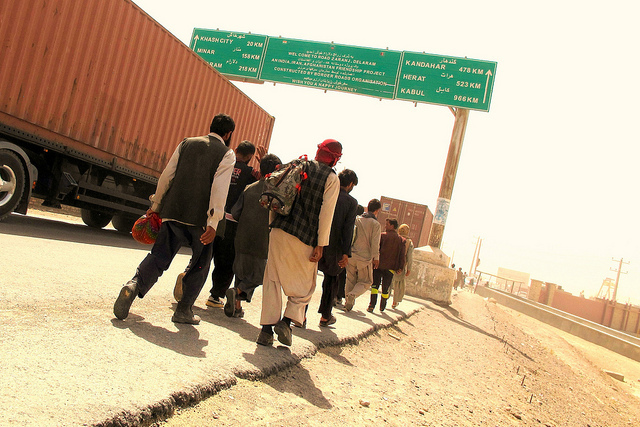 After reaching Zaranj from Kunduz, located on the northernmost edge of Afghanistan, they crossed the border illegally. They were five in all, but one of them, a seven-year-old, has not yet made it back. “When we were arrested by the Iranian police, they dragged my brother Mohammed and myself into one car, and my parents into another one. That’s when our little brother disappeared,” says the teenaged migrant. “My father is going to try to go back today to get him,” he adds, still in a state of shock. Najibullah Haideri, head of the International Organisation for Migration (IOM) in Nimruz, tells IPS that Iran deports an average of 600 men and 200 families on a monthly basis. Meanwhile, Ahmadullah Noorzai, head of the UNHCR office in Zaranj, tells IPS that the wave of deportations started six years ago. In a report released in 2013, Human Rights Watch pointed out that Afghans, by far the largest expatriate population in Iran, are subjected to a host of abuses by both state and private actors, which violate Iran’s obligations under the 1951 Refugee Convention and endanger some one million Afghans recognised as refugees, as well as scores of others who have fled the war-torn country. According to HRW, hundreds of Afghan migrants are believed to have been executed in recent years without any notification to Afghan consular officials. “Getting a visa to Iran costs about 85,000 Afghanis (around 1,150 euros),” the manager of another hotel in Zaranj, who prefers to remain anonymous, explains to IPS. “Prices for an illegal entry start at 25,000 (around 330 euros), but it always depends on the final destination. The most expensive are Tehran, Esfahan and Mashad – Iran’s largest cities. Migrants pay only when they reach their final destination so they’ll try again and again until they make it, or until they get killed,” adds the innkeeper. Just behind him, Hamidullah, 43, and his son Sameem, 17, wait their turn to access a better life. Chances are, they’ll be back at this border crossing before too long.